Home > Computer > What is Wireless Internet and How do I Use it? There’s been a lot of talk recently about wireless Internet and how it’s a great new technology that can, and will, change your life. But what exactly is wireless Internet, and how do you use it? To be brutally honest, the wireless Internet is no different to the wired version. All that’s different is the method of connecting you PC to the Internet. As the name suggests, it’s done without wires. If you currently have wired Internet then you can only connect to the Internet where you can plug your PC into your modem. Wireless Internet allows you to access the web anywhere in your home, without needing to physically connect the PC to the modem. If you want to surf the net in the kitchen but the modem is in the office upstairs, you’d have to run a wire through the house with a wired system. With a wireless system the PC in the kitchen can connect to the modem in the office with nothing more than radiowaves. You’ll need a wireless base station to transmit the signal, and each PC you want to connect to it will have to have some wireless capabilities. Once you’ve sorted that out, all you have to do is run the installation CDs that are supplied with the base station, and you’re ready. 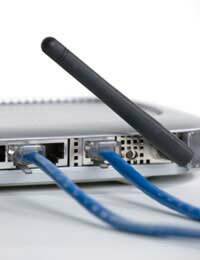 You need to be aware of a few things that make wireless connections much less secure than wired ones. A wireless base station broadcasts what’s called an SSID. This is the name that’s used to identify the signal and allow you to log on to it. If you don’t use encryption then this is available to all PCs within the broadcast area. This can be as much as 100 meters so if you live in a city, or a densely populated area, you could be letting countless people onto your connection if you don’t secure it. This can mean nothing more sinister than someone using your broadband connection, but it could also allow people to see the contents of your PC and intercept details such as site log on and passwords. So make sure you read all about the various security options of your base station, and implement them, to ensure your PC is totally safe. There are also some concerns that the wireless transmissions can be harmful to humans, though scientific data has so far, been less than conclusive on this matter. If you are worried about wireless access, there are plenty of resources on the web that will help to reassure you and a quick search will produce plenty of data against the idea that Wi-Fi poses any danger to your health. Once you’ve gone wireless there really is no turning back. Using the laptop to check emails whilst you’re sat in the garden is just one benefit but there are more and more places, such as coffee shops and restaurants, offering high-speed wireless connections now that you can also use with the right equipment. Wireless Internet gives you much more freedom that the wired sort. If you secure your network, and make the most of the flexibility it offers, it’s a great tool that allows you to surf the net from anywhere in your house.